Guides and Snowwalkers alike have depended on Snowtrekker Tents to take them to the farthest reaches of the winter wilderness while outfitters count on the absolute dependability of our winter tents. Snowtrekker Tents are changing the way people think about cold weather camping by providing campers with a lightweight, easy to set up tent that allows you to lounge around in your long underwear, soaking in the heat of the wood stove, an hour after selecting a campsite. 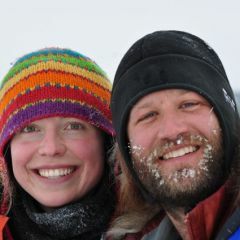 I lived in a Snowtrekker during dozens of outings, from two-month dog sled expeditions to weekend shoulder season canoe trips close to home, and I would recommend them to anyone interested in cold weather camping. Stay warm and enjoy camping any day of the year. From the backyard to the back country, you can depend on Snowtrekker tents to keep you comfortable. Our stoves are the perfect addition to your canvas tent. They fit perfectly inside your tent and keep you warm throughout the winter months. While your Snowtrekker tent is all you may need to enjoy a warm experience in the winter wilderness, these accessories will make your adventure much more enjoyable. Ready to get your new Snowtrekker Tent?